WE ONLY REMOVE UP TO 800 LBS OF ROCK OR DIRT. WE USE WHEELBARROWS AND SHOVELS. IF YOUR JOB IS LARGER THAN THIS WE CAN NOT HELP! Need rocks removed? No problem. If there's one thing we can do it's moving rocks! No matter the size of rock we do it all. 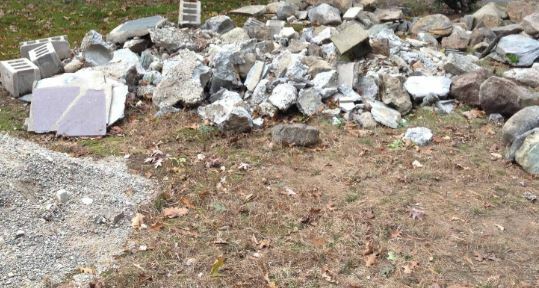 We can remove big boulders, or small rocks. Whatever the need lets us know and we can get them removed so you can get your projects completed! Here in Arizona the one thing almost every yard has is rocks. Well, if you looking to be different from the rest of your neighbors and want to get rid of those little rocks all over your yard, we can help. We are experts at landscape rock removal! Whether your planning to put in some grass, or even some pavers or a pool. We can help prepare your yards. Trust Junk Removal Phoenix as your Rock Removal Professionals! Call or submit for an estimate today!